I have attended countless UN Climate conferences during the past two decades, but Marrakech will be among the more memorable, and not just because there was a sense of renewed determination here in the face of the election of Donald Trump. Two things inspired me today. 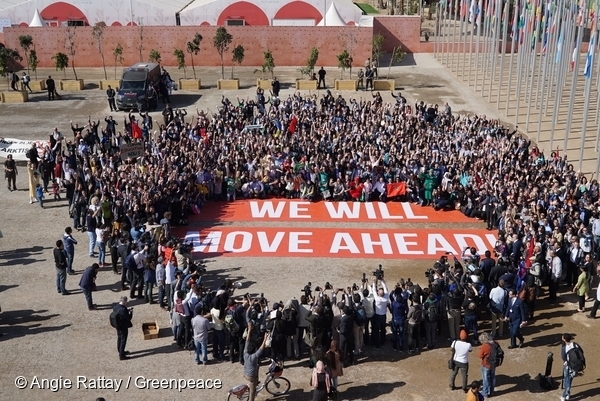 Standing with hundreds – from the Moroccan Minister of the Environment to grassroots activists fighting to keep fossil fuels in the ground – around our giant #WeWillMoveAhead banners. It was hot, but I felt a sense of connection and determination through this moment of shared solidarity. Thanks to all of you who sent your #WeWillMoveAhead messages. Keep them coming. The second inspiration today was 47 countries at the forefront of climate change committing to a 100% renewable future. That is the kind of vision and leadership we would want from everyone. The Climate Vulnerable Forum is setting the pace here and we will be their supporters and allies all the way so that their Marrakech Vision is turned into reality on the ground. Indeed, there is much hard work to do when we get home. The mood here was positive and determined. But the news is not good. 2016 will be – once again – the hottest year on record. And while global climate pollution is no longer rising quickly, it urgently needs to come down. Coal plants have to close very soon – and there need to be just transition plans developed for all workers affected. Still, the transformation of the electricity sector is now unstoppable. Not only the 47 vulnerable countries are committed to it. We are also seeing cities, islands, states and businesses delivering 100% renewable electricity on the ground. But that is only the start. To prevent dangerous climate change we need to transform also the transport sector and urban planning, switch to agro-ecology and protect our forests and oceans. Indeed, we need to transform the way we live and share our resources more fairly. There is much work to do. But what we can learn from the electricity sector is that one of our founders, Bob Hunter, was right when he said that “big change looks impossible when you start and inevitable when you finish.” I remember how people looked at me strangely when I said that a 100% renewable world is possible. Those days are over. The renewable energy revolution is now a reality. We need to replicate the success we are having on electricity in other sectors. Inspired by the solidarity I felt today, I know we can do it. So let’s. Together.